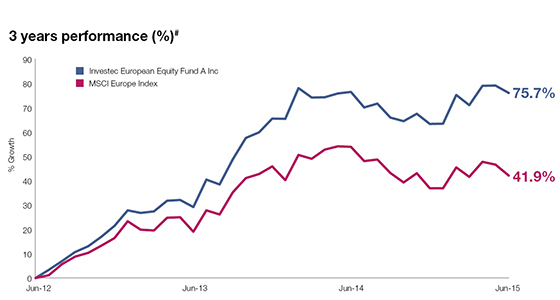 Investec European Equity Fund (the "Fund") invests in limited geographical locations (i.e Europe) which can be more volatile than more broadly diversified portfolios. Equity investments could be volatile and subject to high risk of loss. The Fund may hold investments exposed to economic conditions in Europe, particularly in eurozone and may be subject to increased risk of sovereign default, foreign exchange fluctuation, volatility and market liquidity. Investors should not soley rely on this document to make investment decisions. *The investment objective of the Fund was amended on 30.11.12 to include investment in the UK. **Internal parameters subject to change without prior notice. ***Comparative index change from MSCI Europe ex UK NR to MSCI Europe NR on 30.11.12. Fund ratings may be provided by independent rating agencies based on a range of investment criteria. For a full description of the ratings please see www.investecassetmanagement/ratings. Ken Hsia is AAA rated by Citywire for his 3 year risk-adjusted performance for the period 30.06.12 – 30.06.15. The Morningstar rating shown is based on the A Inc share class, the primary share class. #Source: ©2015 Morningstar. All Rights Reserved. Data as of 30 June 2015, based on A Inc Share class. Fund rating does not guarantee that the fund constituents, or fund prices will not fluctuate. Calendar year performance: A Inc USD – Year 2010: 10.09%; Year 2011: -17.63%; Year 2012: 29.84%; Year 2013: 36.25%; Year 2014: -1.36%; YTD (30.06.15): 7.81%; A Acc USD Hedged (Portfolio – AC): Year 2014: 4.25% (since launch on 14 July 2014 to end2014); YTD (30.06.15): 11.08%. A Inc share class and A Acc USD Hedged (Portfolio-AC) share class were launched on 25.01.1985 and 14.07.2014 respectively. Quartile ranking within the Lipper European Equity sector. ^Bloomberg Businessweek Top Fund Awards evaluation based on the fund performance as of 30 September 2014. Best Fund Manager Awards highlight those individual managers adding the most value above their Citywire applied benchmark over three years until 31 December 2014. The value of this investment, and any income generated from it, will be affected by changes in interest rates, general market conditions and other political, social and economic developments, as well as by specific matters relating to the assets in which it invests. The Fund’s investment objective will not necessarily be achieved and investors are not certain to make profits; losses may be made. Past performance figures shown are not indicative of future performance. Investment involves risks. Investors should read the Prospectus for details, including the risk factors. All the information contained in this communication is believed to be reliable but may be inaccurate or incomplete. Any opinions stated are honestly held but are not guaranteed and should not be relied upon. This is not a buy, sell or hold recommendation for any particular security. The portfolio may change significantly over a short period of time. This communication is provided for general information only. It is not an invitation to make an investment nor does it constitute an offer for sale.The full documentation that should be considered before making an investment, including the Prospectus and Product Key Facts Statement (KFS), which set out the fund specific risks, is available from Investec Asset Management. The Fund is domiciled in Luxembourg. This communication should not be distributed to private customers who are resident in countries where the Fund is not registered for sale or in any other circumstances where its distribution is not authorised or is unlawful. Please visit www.investecassetmanagement.com/registrations to check registrations by country. In Hong Kong, this document has not been reviewed by the Securities and Futures Commission (SFC). The company website has not been reviewed by the SFC and may contain information with respect to non-SFC authorized funds which are not available to the public of Hong Kong. THIS INVESTMENT IS NOT FOR SALE TO US PERSONS. Telephone calls may be recorded for training and quality assurance purposes. Issued by Investec Asset Management Hong Kong Limited.